I’m here with a call for authenticity in my favorite holiday, that gastrointestinal extravaganza, Thanksgiving. Who am I to say so? I speak with the authority of one who was wakened (woke? awoken? waked? 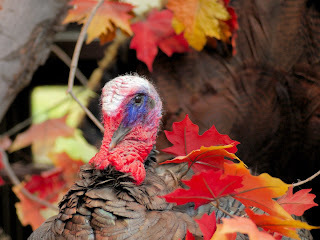 In any case I ceased sleeping) because of the glorious gobble of wild turkey just last week. I lay huddled in a quaint shelter while the cold Atlantic wind battered the Massachusetts shoreline. It was so…Plymouth Plantion-ish. Well, except I was wearing a hooded sweatshirt to bed, and we were on Cape Ann. For your proper Thanksgiving meal: no potatoes, white or sweet. I can assure you sweet potatoes do not grow well in the north! Hold the gravy, sugar peas, dinner rolls, whipped cream and gasp—green bean casserole! Dressing? Doubtful. Pumpkin pie--highly unlikely without milk, cream or an abundance of egg-laying chickens. Chooseth instead: quail, swan, duck, goose, cod, bass, clams, mussels, lobster, eel, walnuts, acorns, chestnuts, and beans. The Pilgrim chicas spent days preparing for a harvest celebration meal. Were they expecting ninety members of the Wampanoag tribe to show up and stay for three days? (They did not bring their wives along to help in the ‘kitchen’, either.) At least these guys pitched in with venison. Take heart. The meal did include turkey and squash! The Pilgrims might have been able to add some foods they’d brought by seed from Britain: onion, leeks, sorrel, radishes, and herbs like liverwort and watercress. Fruits—notice no mention of cranberries—included dried gooseberries, raspberries and grapes. Added to a ground cornmeal with bear grease they could make a steamed ‘pudding’ dessert. Yum O. No artificial ingredients you can’t pronounce. Records show that only four of the pilgrim wives survived the previous winter as well as three to five teen girls. Do you suppose these ladies gave a hearty thumbs down on the idea of making this a yearly tradition? Thouest would be correct. It wasn’t until the writings of William Bradford resurfaced around 1854 that New Englanders began celebrating ‘Forefather’s Day’. But I digest. I mean digress. Back to food. I love turkeys. One winter, our neighborhood wild flock took to overnighting at the edge of our woodlot. I’d go out in the morning and often see their tracks all over the snow next to my truck. Once I caught them still roosting in the shrubs and trees. They were none too happy with me and hopped and dropped and gobbled and squawked. Big brown and beautiful. What's not to love about that? I do see turkeys everyday. The domestic kind. Soon, I’ll drive by and they’ll be gone. It happens every year and I can't figure out where they go. My money is on North Carolina where pilgrims can grow hearty sweet potatoes to be proud of. Okay. Truth is I know those big white birds are destined for your table. They can’t fly like their brown cousins. Sadly, they can’t even mate because they’ve been bred to have such large chests, that the male cannot… well, I’ll leave it at that. So I have to ask. White meat or dark? Enjoy the holiday, whatever way you see fit to celebrate. The Pilgrims headed west, across an endless ocean, to practice their religion freely. 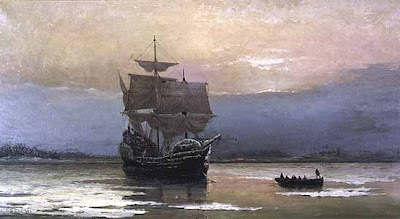 They were thankful for the gift of freedom and for the friendship and support of a tribe of natives who showed them how to survive in a new world. I'm no expert but their true story is a fascinating one and I hope this will encourage you to discover more about it. "All great and honorable actions are accompanied with great difficulties and must be overcome with answerable courages." Imagine the shock when two known natives arrived at different times, able to speak English! Okay, I must have a little bit of a grammarian in me somewhere, because all I can keep thinking about now is the proper use of "Thee" and "Thou". I read a book recently where I thought it was used wrong, but what do I really know? I always assumed "Thou" was nominative like "I or We" and "Thee" was subjective like "Me or Us". Of course I can't even use "You" as an example because its such a lazy pronoun and doesn't even bother to change. Maybe that's why we ditched thee and thou. Perfect timing as Anne & Stahl are just sitting down to supper. (She kinda makes a mess of things--always had a cook in Albany) Eel won't be one of their choices though! So you got a chance to "rough it"? Have a blessed Thanksgiving--and enjoy! Oh Dina, you have to let this grammar stuff go once in a while.Be Free! I just made it up. Thouest? very suspect indeed! ha ha ha. In the latest Outlander book, there are two Quaker characters and I found it quite enjoyable actually to hear their 'thees and thous'! well, we didn't exactly rough it but we stayed in an uninsulated tiny little cottage that was not quite made for winter. In other words, it was probably much warmer and cozier than those our 'forefathers' had. We are quite wimpy people these days in the US. I get chilled if my house is 64. Many have had to break the ice in their water pitchers in the morning to wash their faces, eh? Eagles are much more poetic. Just imagine if the turkey thing caught on... We would (potentially) "mount up with wings as turkeys"... I don't think so. Or what about Steve Miller's "and the eagle flies with the dove"... Turkeys and doves just don't go together. Neither do eagles and doves if we are being sticklers today. We Americans do tend to romanticize. LOL - I love it! Great post! Yes, Deb, it was obvious you were just having fun with it, which I loved. Just brought to mind my issues with using them poorly in actual historical fiction books. I enjoyed this post. It gives me something to think about. A lot of times in the past when I would ride my bicycle on the roads around my house I would see wild turkeys. Dina, you can have my white meat then. I like dark. Though there is something primitive about ripping it off the bones that bothers me. And of course, it has a lot more calories. oh well. Cheryl, I so agree. I was thinking of mentioning a few things that would change. Like those eagles at the ends of flag poles, and above the doorways of federal buildings. My school mascot - The Wayne Turkeys? no way! Hey Bex! How are you? I expect your children would squeal with delight or disgust if you presented a plate of eels this year. Oh yes, they would totally get into it. We have considered serving lobster instead of turkey this year since I am not hosting Thanksy (for the first time in 5 years) because everyone else will be out town! I think I like Turkeys because they do remind me of 'history'. We never saw any when I was growing up so I was pleased to start seeing flocks become established again in my area. What frightens me is when they decide to fly - They are notoriously low flyers. Like WINDSHIELD HEIGHT off the ground? Thanks for commenting! Bex, I think you will enjoy a quiet one. One of the best parts of the holiday for me is the fragrances coming from the kitchen. I love that it's a family and food holiday without the big expectations of Christmas. I spent one Thanksgiving alone when I was staying at my Aunt's for a month while she recovered from surgery. She had to go back in the hospital, so I spent the day there (at least had some turkey in the cafeteria) but went home to her empty house. I felt quite left out, knowing what was going on back home with the rest of my family. I hope everyone considers inviting a 'single' to their home for the holiday. Actually, I've always thought of 'thou' as 'you', too. But only because the Bible uses it in the 10 commandments. Since they came from God, I've always assumed He was talking directly to me. As if He was pointing His finger at me and saying, 'Thou shalt not kill'. Okey, dokey. Yessir, I hear ya. About the Puritans... Nelson was on the ancestry website yesterday and asked what Puritan means. Of course I didn't know what site he was on and said, 'The Puritan Flour company'. He said because in the ancestry logs, some of his ancestors list 'Puritan' as a religion. Neat, huh? Great post, Deb. We used to raise rare breed turkeys and I have a photo of Nelson sitting on the lawn and a Broad Breasted Bronze taking food from his hand. Fabulous post! I givest thou a wholehearted round of applause. Pass the white meat! Now I'm hungry for turkey leftovers...a la king, soup, and yummy salad with dillweed. Mmm. I'm thinking about brining my turkey this year. Has anybody ever done that? Anita, as I did some research on this, I found that The Puritans and The Pilgrims would be very annoyed if anyone confused them with each other. But I can't tell you the exact differences, either. I love the idea of feeding one of those big birds out of my hand! Cool! Hey, if you fed them stuffing... oh, just a thought. never mind. Susie, I'm hungry for leftovers already. We had a semi-Tday dinner (our Harvest Supper) at church last week. All the regular items plus a lot more. One boy asked about a particular dish, and I said, "if it's got marshmallows on top you can assume it's sweet and good"
That was by the turkey and not on the table full of desserts! Let us know how the brining comes out if you do that. Deb, this was a hoot! Or a gobble, if we're going with bird-speak. Our county is well-known for its plethora of wild turkeys. So many, in fact, that at certain seasons of the year we have to watch for entire flocks on the highway the way we watch for deer and elk. We even had a trio of them pass through our property a couple of winters ago. They hung around for about a month, roosting in the cottonwood trees at night. Susie, you and I must be on the same wavelength. I was thinking about brining our turkey this year! What a fantastic post, Debra! By the way, my husband,Bradford, is descended from the Governor himself. Thanks Niki. I started out trying to be serious until I heard myself responding in incorrect Pilgrimese. Then it all went downhill. Sorry to hear about your 'wild animal crossing' concerns. Deer are a huge problem here--used to be problems just during the rutting season but they are so overpopulated, they cause accidents all year long. I'll take the duck and the raspberries and skip the rest, thank you. I vividly remember making those "collars" in school. I guess the question here is whether we'll have a "white" Thanksgiving. I was just thinking... I didn't see any mention of lobster. Apparently no one was trapping them back then? Of course then you'd need butter, too! I'm glad for a week of warmth now and willing to wait a few more weeks for the white stuff. Hope to see you soon, as well. Dina, I can give you a lesson on thees and thous, etc. My husband is rather into it as an amateur hobby sort of thing. Here's a start: dost thee thou me? Response: Yes, I thou thee. Or Do not though them as they thou thee. I'm not picky about white or dark, dark if it's a certain cook who thinks everything has to blow away like a Texas dust storm or it's not cooked. White if I or my mom makes it. No green bean casserole for us, but definitely the sweet potatoes with a praline type topping. We also have crab puffs, Dutch apple pie, and pumpkin pie, some sort of vegetable. No squash if I'm cooking. Handmade dinner rolls, mashed potatoes--real ones--and whatever else someone requests. No gravy unless a guest particularly requests it. Stuffing from a Scottish cookbook, which means it's mostly onions. I haven't made T-giving dinner in years, so am looking forward to it this year. Oh, yes, and the cranberry sauce has to be from a can. I prefer my homemade, but my guests request the jellied stuff. BTW, the Puritans often bother me, since I know a fair bit about their history. They came to America to practice religious freedom--as long as it was their version of religion. Thanks Laurie Alice. Crab puffs sound wonderful. And I can't understand the loyalty to the jellied cranberry sauce but I'm obligated to include it too. As for the thee/thous, I see it's even worse than we imagined! Kudos to your hubby for getting to the bottom of it. Thee and thou are informal. When Sir Walter Raleigh was convicted of treason, that is when he said that famous line of Dost thee thou me. In other words, he had been reduced to someone only worthy of being addressed as a lower class person, but in asking, he did it the same to those who accused him. Don't thee thou them as they thou thee--Don't put someone else down just because they do the same to you.